BEREA, Ohio (AP) — Jabrill Peppers has started playing self-defense. 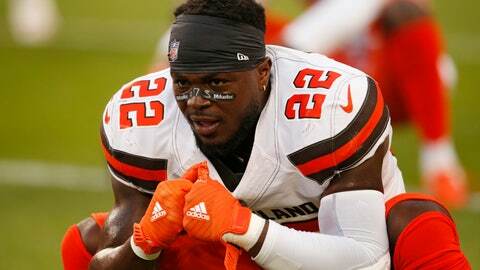 The Browns defensive back said Thursday — his 23rd birthday — that he has stopped going out in public by himself in downtown Cleveland following hostile confrontations with fans unhappy with the way he’s played. Peppers said he has endured verbal taunts and some joking in the past, but that lately some of the encounters have nearly gotten physical. Peppers said he has been confronted numerous times and believes some of the grief he’s taken is because he went to Michigan and plays in a city where rival Ohio State fans are abundant. “Sometimes it’s more so jokes, but as of late it’s kind of a little bit more different situation than just verbal,” he said. Peppers also tried to clarify comments that Browns fans are “very, very wishy-washy.” The former Michigan star said he wasn’t referring to die-hard Browns fans, but rather to an overall environment that exits in Cleveland — and other cities. “This is the NFL and that’s how it is,” he said. “Love you when you’re doing good, and they don’t when you’re not. We know we have to play better. Obviously, I wasn’t talking about the fans as a whole — just more so the environment of an NFL franchise. We understand the city of Cleveland loves their Browns and wants to see us get back to how it’s supposed to be. Peppers said he has taken to covering up when he’s out shopping, but that hasn’t helped much. “I don’t want to walk into a store with a hoodie on, that’s just bad manners,” he said. The No. 25 overall pick in the 2017 draft, Peppers has not lived up to expectations and he knows that’s at the root of the backlash he’s getting from fans. He’s been moved around in Cleveland’s defense as the Browns try to figure out how to best use the 5-foot-11, 215-pounder who was one of the nation’s most impactful players in college but hasn’t had close to the same success as a pro. Peppers has also struggled returning punts and kicks, and his lack of production has drawn the wrath of some Cleveland fans. He understands it’s up to him to change the narrative. But despite the recent negative experiences, he has not soured on playing in Cleveland. “I love the Browns. I love the city,” he said “I love how passionate the fans are and part of what I get is my fault.